Jujitsu (also known as Juijitsu, JuJutsu) is a Japanese martial art that focuses primarily on joint locks, throws, chokes and grappling. The locks and chokes can also be done using weapons. Jujitsu was used by the Samurai as their hand to hand system. Striking arts are not as effective when facing a fully armored opponent, but joint attacks and throws worked very well. Jujitsu uses joint locks which are just hyper extensions of the various joints to control or submit an attacker. Your body warns you that a joint is past its range of motion by giving you pain so you stop hyper extending a joint and pull it away or move away from the source of pain. Jujitsu uses the attackers natural pain response to control them. They will move away from the pain so normally we will put the pain high and drive them downwards away from it to the ground. An attack on the ground is physically, mentally and tactically in an inferior position. Most attackers once they are mobilized will give up when given the option to do so. Jujitsu gives you the ability to control self-defense scenarios without doing serious damage to the attacker. This allows you to have a range of possible responses, from avoiding or checking an attacker to controlling them and putting them in a hold and then if necessary doing them significant damage. Any jujitsu joint lock can also be a joint break. 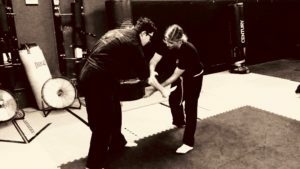 Instead of just holding it near hyper extension if needed in a self-defense situation we can drive it past its range of motion damaging the joint. 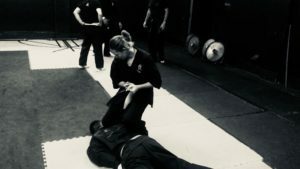 For example, if the attacker has a gun or knife and we have gained control of their weapon arm using our techniques, we then have to do the attacker damage so that they will not be able to continue to try to use the weapon against us. It does not make sense to release the weapon arm so that we can use Karate or Krav Maga striking to try to incapacitate the attacker. If we let him go, there is a good chance he will be able to get the weapon free and attack us again with it. So, Jujitsu will allow us to retain control of the weapon arm and hyperextend or break it. At that point most likely the attacker well not physically or psychologically be able to continue his attack. Jujitsu also allows us to put the opponent in chokes. Chokes can be dangerous and can do some damage to the throat and neck, but used correctly they allow us to very easily controlled the opponent and if necessary knock him unconscious by restricting his oxygen flow. Usually it’s not necessary to choke an opponent unconscious, most attackers when put in a serious choke will take the option to quit their aggression. From there do you have the option to put them in a different submission hold to keep them restrained or if you think it’s wise you can give them a warning and release them. Done correctly most people will think twice about coming back to attack you again. Jujitsu is by far the best hard for these types of locks, holds, chokes and submissions. Some other arts have these skills as well: some Filipino martial arts like Kali or Arnis de Mano, Brazilian jujitsu, some forms of kung fu, pentjak silat etc. Jujitsu skills also allow you to defend against the opponent doing joint locks or chokes on you.